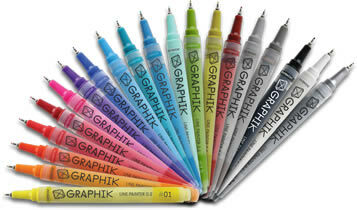 Derwent Graphik Line Painter Pens have a 0.5mm nib and come in 20 colours of opaque paint. Dilutes with water but permanent when dry they are lightfast and can be used for creating layers and ribbles as well as washes and fine lines. Beautiful, versatile pens for all kinds of illustration and drawing.